Relatively late last year Sega gave us some news that we'd been waiting for - the second wave of 3D Classics on the eShop are coming to the West. Those with a Japanese 3DS have been enjoying these for a while, but the confirmation that 3D After Burner II would come early this year brought optimism; Sega wasn't kidding when it said early. The 3DS eShop in Europe is now listing the title for 15th January at £4.49 / €4.99, and in the picture below you can see we've already added it to our wishlist; bizarrely, the listing does dither between formats for the name! The following will arrive in upcoming months, which we hope will mean February onwards - we're pretty sure release dates will either match or be similar in North America. Are you looking forward to these games and 3D After Burner II? Let us know. Hopefully in North America at the same time. What? Since when did it say: 'This title is available in English' at the top of every product? Yep, day one for me! 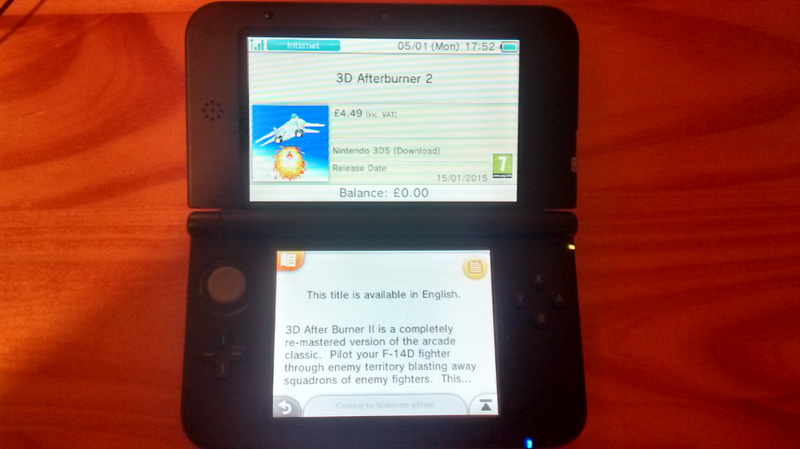 I am still very, very upset at SEGA for the mess "Sonic Boom" is, but "Afterburner" much like "Outrun" are pretty much some of my gaming childhood memories, so carrying an arcade in my pocket is a luxury I won't pass for just 5€. I bought it on my Japanese 3DS, so I probably won't be getting the localized version. Great game, though! Sega's 3D ports of their arcade classics have not failed to impress. I'll take both Outrun and AfterBurner II, which was a favorite for my brother and me as kids. Fun trivia: After Burner was one of the games John Conner was playing in Terminator 2. Los Angeles here. And I can't help but say,"Hey?!" I don't understand why SEGA has yet to post any vc classics on wii u yet!! Wtf!?!? Lord knows they're sitting on a pile of classic games that hungry wii u owners would snap up!! I feel they're losing $$$ with this strategy!! omg finally. i will probably get afterburner II, but what im the most excited about is fantasy zone!!!!!!! that is one of my favorite games i played as a kid. i cant wait for a release date. i hope its soon. also i recently played the new afterburner game in an arcade. it was pretty fun cause the seat and basically the entire game tilted and moved when u turned and stuff. but it was very difficult. alot harder than the original, but fun. @Scary_Old_Lady I think that's used when the game is not available in other European languages. I think this version will have the option to play the music with lead melodies? Awesome! Hope some of those are the arcade versions. YES YES YES!!! ... YES!